We’d love your help. Let us know what’s wrong with this preview of Penguins and Golden Calves by Madeleine L'Engle. Despite protests and warnings from friends and family, author Madeleine L’Engle, at the age of seventy-four, embarked on a rafting trip to Antarctica. Her journey through the startling beauty of the continent led her to write Penguins and Golden Calves, a captivating discussion of how opening oneself up to icons, or everyday “windows to God,” leads to the development of a Despite protests and warnings from friends and family, author Madeleine L’Engle, at the age of seventy-four, embarked on a rafting trip to Antarctica. Her journey through the startling beauty of the continent led her to write Penguins and Golden Calves, a captivating discussion of how opening oneself up to icons, or everyday “windows to God,” leads to the development of a rich and deeply spiritual faith. Here, L’Engle explains how ordinary things such as family, words, the Bible, heaven, and even penguins can become such windows. She also shows how such a window becomes an idol–a penguin becomes a “golden calf”–when we see it as a reflection of itself instead of God. To ask other readers questions about Penguins and Golden Calves, please sign up. Madeleine L'Engle, an icon herself, ruminates on iconography and idolatry, the relationship between penguins (icons) and golden calves (idols) and how such particulars have played and worked out in her own writing life story. Preaching to the choir of art, faith, and mystery as well as trying to connect and find common ground with the fundamentalist and literalist crowd. Reflections via ramblings and repetitions. Some really wonderful words of wisdom at times. Where in the world is Antarctica? It's pretty obvious that in doing all those writers' workshops and giving talks, she encountered more than her fair share of spite and contention in the name of Jesus. Her rebuttals go from near heresy and back to Biblical, all the time sifting out the lies like chaff until only the grain of truth remains. Although this was scattered at a bit rambly at times, I can't deny how powerful much of its content is (especially the last third). This book was exactly what I needed at this time in my life. I love when that happens. I chose Penguins and Golden Calves for a re-read because my Bible study group is studying Exodus this spring, and I knew we’d get to the golden calf story eventually. I didn’t remember a lot about this book, but I knew I had read it before. Apparently, based on the inscription on my copy, my mom gave me this book for my birthday in 2006, and I’m guessing that was the first and only time I’ve read it! And yet, I think because I’m so familiar and steeped in Madeleine’s writing, it all felt known a I chose Penguins and Golden Calves for a re-read because my Bible study group is studying Exodus this spring, and I knew we’d get to the golden calf story eventually. I didn’t remember a lot about this book, but I knew I had read it before. Apparently, based on the inscription on my copy, my mom gave me this book for my birthday in 2006, and I’m guessing that was the first and only time I’ve read it! And yet, I think because I’m so familiar and steeped in Madeleine’s writing, it all felt known and comforting to me. There are also parts of this book from when Madeleine visited Antarctica that inspired Troubling a Star, so those passages felt even more recognizable and cozy. But the biggest thing that stood out for me as I re-read this book was how weird Madeleine’s writing about faith can be. 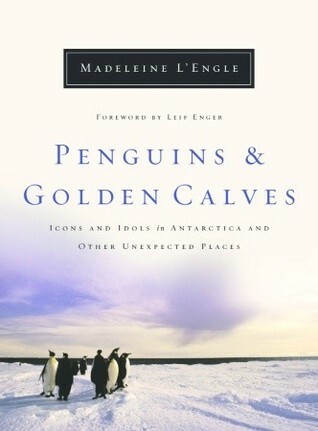 In this book, Madeleine L’Engle shares details about her trip to Antarctica at the age of 74, and the things she learned about the area and penguins while there. She explains why she thinks that penguins and many other things can be icons ( windows to God which leads to the development of a rich and deeply spiritual faith) and rounds it out with her feelings about idols (those things that we see as a reflection of themselves and are worshipped that way). I often felt awe at things in nature and In this book, Madeleine L’Engle shares details about her trip to Antarctica at the age of 74, and the things she learned about the area and penguins while there. She explains why she thinks that penguins and many other things can be icons ( windows to God which leads to the development of a rich and deeply spiritual faith) and rounds it out with her feelings about idols (those things that we see as a reflection of themselves and are worshipped that way). I often felt awe at things in nature and an incredible sense of God’s creation, so I have to say that I appreciated this observation and others like it. I also feel that she does a wonderful job of explaining why we should be careful that our icons don’t become idols. Icon versus idol. This is what L’Engle explores in this exceptional book. I quickly realized I was in more than capable hands as I delved into potentially complicated text. She skillfully explains some complex theology, but never loses sight of the great Mystery that is the heart of Christianity. And over and over she emphasizes LOVE. This emphasis on love and compassion and reserving judgment for God make Penguins and Golden Calves a timely Thanks to netgalley and Convergent Books for this ARC. this book is not one to be read in one sitting; so I started it and then put it down to think on, and picked it up bit by bit to work my way to the end. Her thoughts on religion vs belief in God are very thought provoking. I especially loved to read when she wrote that Jesus was not poor, he was a carpenter, and his father had been a carpenter, so they were middle class people. I like that because once you understand skilled labor that becomes self evident. This title is very misleading. The book was largely philosophical and theological in nature. I did enjoy the plunging of my mind into deeper concepts and interesting, thought provoking subjects. I really respected her wise opinions and observations. The theology confused me, but that’s pretty normal for me! I definitely want to read more non-fiction from her because she is an important literary author. Not as many penguins as you'd think! A rambling, sometimes beautiful, sometimes cringe-worthy loose collection of L'Engle's reflections on religion, theology, writing, human nature, and aging. L'Engle's thoughts were a little scattered and disjointed at times, making the book hard to follow. However the nuggets of absolute wisdom she provides are worth the read. Even 20 years after it's first publication, this book is so relevant today. I adore Madeleine L'Engle, but did not realize going in how much this would be a meditation on her Christian faith, and I identified less with this than her other works. I had hoped for more of an antarctic travelogue. I still wish she had written that! Beautiful application of what points to God and what steers us away without being pious. This is another of L'Engle's journal-style pieces of non-fiction. The unifying thread of this book is a discussion of the difference between icons and idols and icons L'Engle has found useful in her life. According to L'Engle, an icon gives greater insight to God. An icon does not have to come from a religious source. L'Engle gives one example of how penguins became an icon for her during her trip to Antarctica. Seeing the highly social but non-intimate penguin communities gave her insight into t This is another of L'Engle's journal-style pieces of non-fiction. The unifying thread of this book is a discussion of the difference between icons and idols and icons L'Engle has found useful in her life. According to L'Engle, an icon gives greater insight to God. An icon does not have to come from a religious source. L'Engle gives one example of how penguins became an icon for her during her trip to Antarctica. Seeing the highly social but non-intimate penguin communities gave her insight into the difference between intimacy and community. An idol does not give insight into God. The idol is worshiped for itself. The danger of icons is that they can become idols if one is not careful. L'Engle gives an example of the Bible as icon or idol. The Bible, if one is a Christian, provides the definitive insight to God. However, if someone ceases to look for God's meaning behind those words (including acknowledging the context and communities where those words were originally given) and instead only pays attention to the literal phrasing of the particular translation they are reading, they have idolized the Bible. Penguins and Golden Calves was not what I expected. This is what comes from choosing books one had never before heard about based on a one sentence description. I was expecting an exploration of how God is revealed through nature, how elements of His creation can be icons for us, how we can see God with new eyes when we marvel at the wonders of His creation. In her opening chapter, L'Engle gives us her definition of an icon. "My personal definition is much wider, and the simplest way I can put it Penguins and Golden Calves was not what I expected. This is what comes from choosing books one had never before heard about based on a one sentence description. I was expecting an exploration of how God is revealed through nature, how elements of His creation can be icons for us, how we can see God with new eyes when we marvel at the wonders of His creation. In her opening chapter, L'Engle gives us her definition of an icon. "My personal definition is much wider, and the simplest way I can put it into words is to affirm that an icon, for me, is an open window to God. An icon is something I can look through and get a wider glimpse of God and God's demands on us, el's mortal children, than I would otherwise." A few paragraphs later, she continues, "If something does not lead us to God it is not and cannot be an icon.....True icons reveal more of God to me than I have hitherto understood." This sounded very promising to me. However, in the following chapters, L'Engle shares her thoughts on topics such as the Bible, family, our mortal bodies, God, and more. The book is an exploration of her own deeply held theology, one with which I share the fundamentals, but on several points we diverge. This, I must say, did not diminish my enjoyment of her writing, because she is a pleasure to read. It is not that I did not understand her points, only that I was hoping for something different. I really enjoyed parts of it, and then other parts were more "eh." I expected L'Engle to sound like less of a grouchy grandmother, but then, she was in her 80s, so I'm not sure why I was surprised. But the latter half of the book became more spiritual, in the best of ways, and at the end of one of the chapters (can't remember which) she wrote out a sort of prayer, and it was impossible not to stop and pray that prayer a few times over. It was pretty great, to say the least. I wish I could give it I really enjoyed parts of it, and then other parts were more "eh." I expected L'Engle to sound like less of a grouchy grandmother, but then, she was in her 80s, so I'm not sure why I was surprised. I wish I could give it four stars - maybe it's 3.5? - but I can't make myself. I still strongly recommend it to anyone who's a fan of L'Engles's fiction, and wants to get a more straightforward idea of L'Engle's Christianity, or if someone wants a really fascinating peek into a brand of Christian faith that doesn't get enough exposure. One of L'Engle's less powerful works. There is discussion of icons, windows into the reality of God's creation; the feminine aspect of God (which was very ... interesting); bits and pieces of her life and travels, particularly her trip to Antarctica, and reflections on our world and society. There just wasn't much this time that touched me or resonated, helping me to look at things in a new light or reflect as I have found in some of her other works. Madeleine L'Engle has been on the fringes of my awareness over many years of Christian book reading. I did read, and enjoy "Wrinkle in Time"a very long time ago. This book was written 11 years ago, when she was 77 and it's a retrospective of her life and her theology. I'm going to give it to a friend who is planning a trip with her mother to the Antartic sometime in the next year. There are lots of penguin facts throughout the book. I'm glad I read it, as it helps me to understand some of her sta Madeleine L'Engle has been on the fringes of my awareness over many years of Christian book reading. I did read, and enjoy "Wrinkle in Time"a very long time ago. This book was written 11 years ago, when she was 77 and it's a retrospective of her life and her theology. I'm going to give it to a friend who is planning a trip with her mother to the Antartic sometime in the next year. There are lots of penguin facts throughout the book. I'm glad I read it, as it helps me to understand some of her statements I'd read in various places. She is careful to distinguish our tendency to love icons, but then turn them into idols from a our desire for a pure faith. This is a quite informative view of the spiritual walk of believers. I'm putting this one under "couldn't read" though I might try again some day. I like Madeleine L'Engle in concept: a good writer who lived her faith. However, this book (like Circle of Quiet) is from her journal and, unfortunately, reads like one: introspective, reminiscent, rambling, stream-of-conscious. Yes, L'Engle has some beautiful thoughts worth sharing. But you need to watch closely for them, since they're buried in random thoughts, including some questionable theology, some society-is-muc I'm putting this one under "couldn't read" though I might try again some day. Yes, L'Engle has some beautiful thoughts worth sharing. But you need to watch closely for them, since they're buried in random thoughts, including some questionable theology, some society-is-much-worse-than-when-I-was-young, some I-was-a-misunderstood-child, some I-did-a-great-job-parenting. M L'Engle, now in her 70s, writes a book about icons in every day life and how easily icons can become idols. I really liked how she defined icons as anything or person or relationship etc who opens a window to God. I realized that I have many icons in my life ... my kids, my relationships with friends, the beauty of nature etc. We make icons into idols when we overlay our expectations on them. This was a chilling thought. I always think of idols as statues etc .... it made me realize that I hav M L'Engle, now in her 70s, writes a book about icons in every day life and how easily icons can become idols. I really liked how she defined icons as anything or person or relationship etc who opens a window to God. I realized that I have many icons in my life ... my kids, my relationships with friends, the beauty of nature etc. We make icons into idols when we overlay our expectations on them. This was a chilling thought. I always think of idols as statues etc .... it made me realize that I have many idols in my own life ... I need to work on that!! I hope that I am as adventurous and thoughtful as Madeline is when I am at her season in life. I would have liked more about her trip to Antarctica, but that didn't take away from the book as a whole. It is very Christian God and Jesus heavy, so readers who aren't open to that should probably not read this. While I'm not Christian, I am interested when someone of any religion explores their faith. I found myself skimming some of the sections that delved into the trinity and all that, but there's quite a bit in here that pertains to life in general. Madeleine strikes again. I cherish any words that she has ever written and this is no exception. She has an amazing ability to touch on tough matters with such tenderness and humility which is very foreign. She does all this with such respect for words quite unmatched. This book makes the distinction between icons and idols as well as some other subjects while always coming back to the ideas of what icons are. Perhaps part of the problem was that I read The Irrational Season at the beginning of the year and I was hoping this would be more like that. There were just too many digressions and stories I'd read elsewhere... and it wasn't as meditative as I found Irrational Season to be. Excellent book. If this was the only book of L'Engles I had read, I would have given it 4 stars. However, I found it to be quite similar to some of her others. That's NOT a bad thing. For me it's an ongoing gleaning from her heart and soul and it continues to speak to me long after I've put the book down. Yes, I would recommend this book. My wife and I read this together. She enjoyed it much more than I did. I felt the narrative rambled too much. L'Engle does offer interesting insights, but one has to be dedicated to reading all the way through each chapter to find them. I didn't realize that this book would be so Christian central. I thought that it would be more about religious icons in general, but this had a lot of discussion of specific scripture and such. Interesting, very insightful, I liked hearing her interpretation of what she discussed.